Welcome to the Trinity School War Memorial Website. We hope you find it interesting. and to provide opportunities for research by current students and staff. 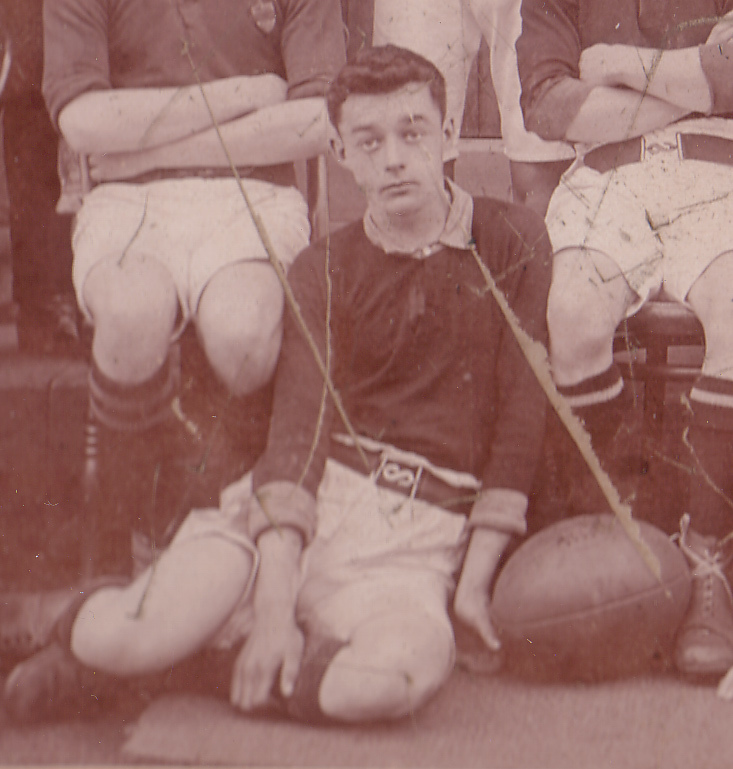 This is very much a work in progress and we would encourage you to contact us if you have any information you can add about any of the Old Boys commemorated here. Please contact Ms Hodgson, Head of History, at lho@trinity.cumbria.sch.uk if you have any information or queries. Thank you. Hover over the images in the final column for further information*. Our WWI Memorial Moodle Page can be viewed here. 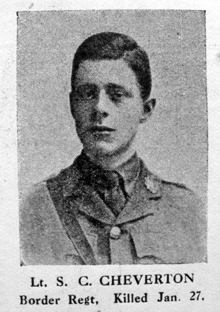 SECOND LIEUTENANT ROBERT MAYSON CALVERT, Manchester Regiment, who fell on July 9, aged 20, was the youngest son of Mr. and Mrs. Calvert, of Burgh-by-Sands, Cumberland. Educated at Carlisle Grammar School and St. 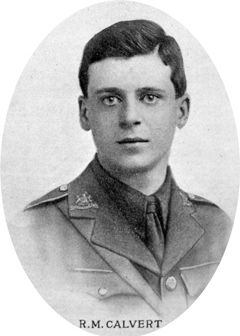 Bees, where he was a foundation scholar, he gained a Hastings Exhibition at Queen's College, Oxford, in December, 1914, He had been a member of the O.T.C. at St. Bees, and received his commission in April, 1916. He went to the front last March. 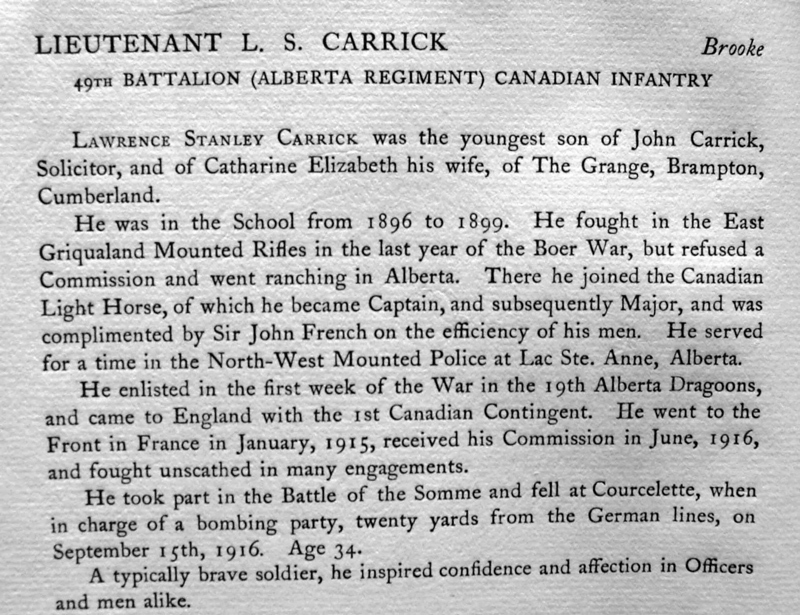 Lawrence Stanley Carrick, was the youngest of eight children born to John and Catherine Elizabeth Carrick. His father and his grandfather were solicitors. They were comfortably off living in a large family home in Brampton with servants. His father died when Lawrence only eight years old. The family seem to have been left comfortably well off. After leaving the Grammar School Lawrence went on to Rugby School. In 1902 he is shown as a "farmer's pupil", however he must have had an adventurous nature as he went to South Africa and joined the East Griqualand Mounted Rifles, and fought in the last year of the Second Boer War. Lawrence was next to try farming in Canada. 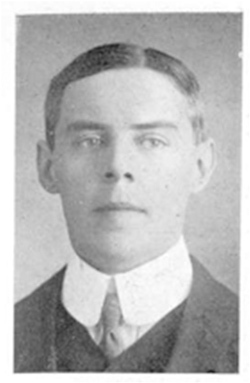 His brother John William Preston D Carrick had gone to Canada in 1896, and he and his youngest sister Eleanor Rosalind travelled out to Canada in 1908 to join him in Pine Lake, Alberta and Eleanor later married Charles Atter and settled there. Lawrence next joined the Canadian Light Horse, and the North West Mounted Police after war broke out he joined up on September 23rd 1914 he joined 19th Alberta Dragoons and came to Europe with the first Canadian Contingent. He refused a commission and went ranching to Alberta. He became Major in the Imperial Light Horse, but owing to lack of time was obliged to resign. He also served in the N.W. Mounted Police. 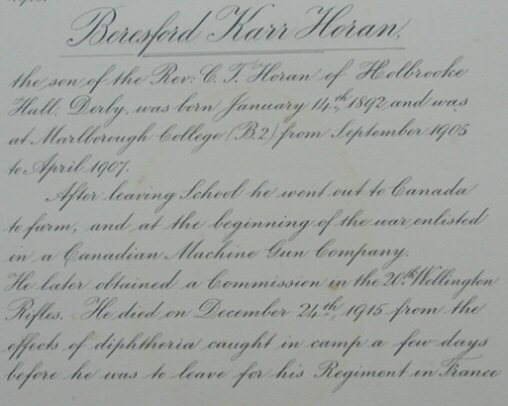 At the first rumour of war he enlisted in the 19th Alberta Dragoons, and crossed with the first Canadian contingent. He took a commission, being gazetted to the Canadian Infantry. On the eve of battle he wrote in the best of spirits:-" Everything is going fine." In January 1917, Cheverton was in France and the 1st Battalion was ordered to attack the Landwehr Trench: " The attack began at 5.30 in the morning of the 27th and met at once with really remarkable success. By 7 o' clock 117 German prisoners had been passed back and reports reached Battalion HQ in Antelope Trench that the first and second objectives had been gained...and stating that casualties had been few...At 8.45...(it was) reported that consolidation of the capturded position was very difficult due to the frozen nature of the ground, that there was little shelling by the enemy but a good deal of hostile sniping. A later report, however, stated taht the enemy seemed alive to the situation, and that his shelling of the position was increasing in weight and volume." (Wylly pg 115) The death of SC Cheverton is reported on pg 116. Border Regiment, son of Lieutenant-Colonel (the Rev.) 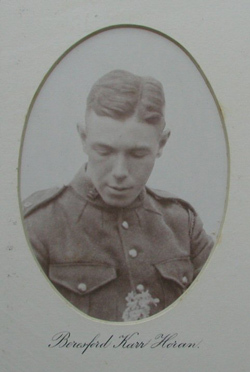 F. J. Cheverton, Durham Light Infantry, was killed on January 27. 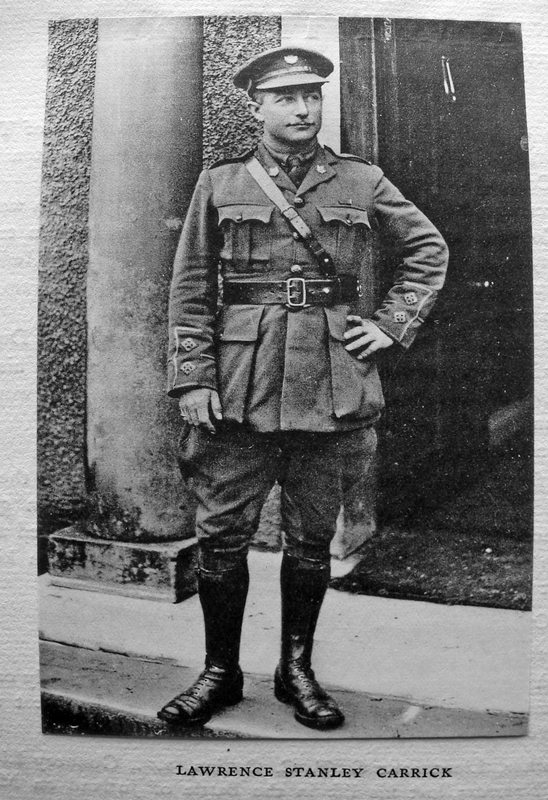 He was educated at Carlisle Grammar School, and on the outbreak of war joined the Public Schools Brigade. 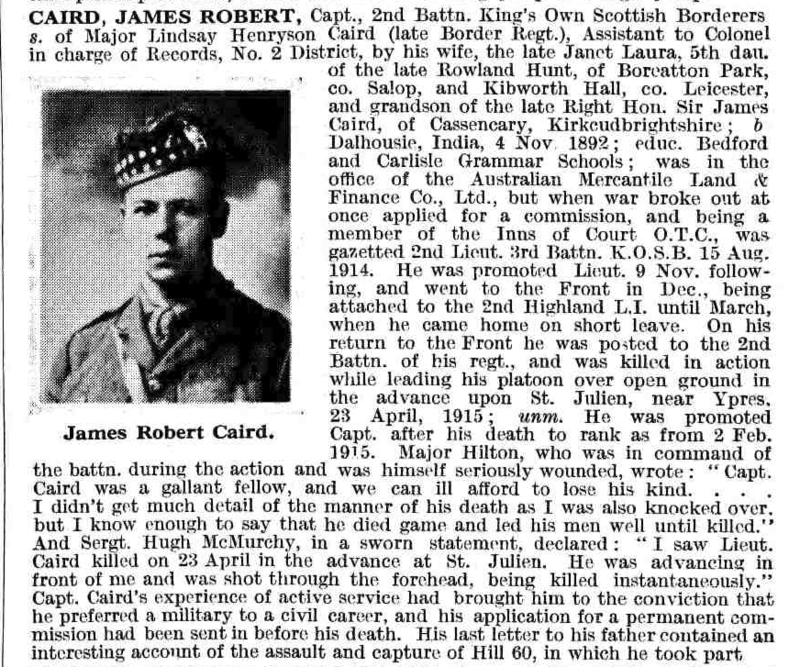 After passing through Sandhurst he was gazetted to the Border Regiment, with which he served in Gallipoli, Egypt, and France. 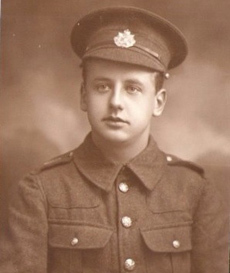 He spent some months in England suffering from shell shock, and on his recovery rejoined his battalion early this year. He would have come of age on March 22. A brother was wounded last year and is again serving abroad. Lieutenant Cheverton's commanding officer says of him:-" He led his platoon most gallantly across No Man's Land right up to the enemy's wire. By his careful handling and keeping his men close up to our barrage our casualties amongst the men were very slight." Peter and Arthur were the two youngest sons of Francis Peter and Jane Dixon. The family business was Cotton Manufacturing and had been for several generations. Peter and Arthur's great grandfather another Peter had established a large family home in Wetheral , in 1861 they had a dozen servants living in! Both grandsons lived there with a large extended family. 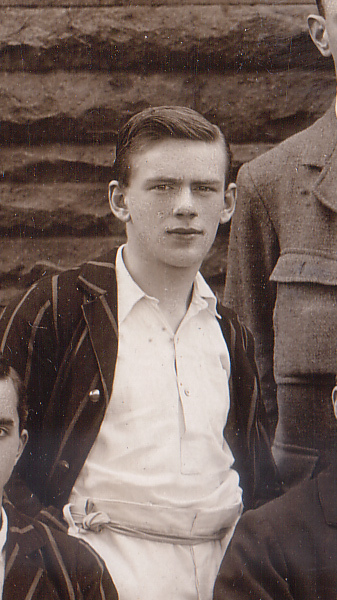 Arthur was destined for the family business, after leaving Carlisle Grammar School in 1903, he attended Denstone College with his brother and then he went to Bolton to gain experience in Messers Dobson & Barlow's cotton works. He is listed as a Cotton Spinning Apprentice in 1911, the family must have believed that the sons learned the business from the bottom up! With the outbreak of war Arthur joined as a private, and was promoted rapidly to 2nd Lieutenant (1914) and Lieutenant (1915), he died of wounds received in Belgium in 1915. His brother Peter was killed three years later. 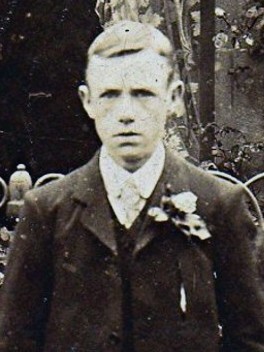 Edward Hughes Dodgson was one of eight children born to Cockermouth Doctor Henry Dodgson and his wife Frances. Sadly his father died in July 1882 leaving his mother to bring up the surviving five daughters and two sons. His father left nearly �8,000 in his will equivalent to �386,000 today. The Dodgsons had lived in the Cockermouth area for several generations and although his mother had been born in London her mother was also from the area. For over forty years the family home was Derwent House, Crown Street, Cockermouth. Edward along with his older brother was first sent to Pocklington Grammar School in Yorkshire and then moved to Carlisle Grammar School. His brother Henry followed in his father's footsteps and became a doctor. Edward became a Land Agent and Surveyor. Edward married Annie Ritson in the summer of 1913. With the outbreak of war he enlisted at Ambleside and joined the Royal Engineers where his surveying skills could be put to good use. He died just weeks before the war ended. He left a modest �2,200 in his will equivalent to �100,000 today. Of Edward's six surviving siblings none appear to have had children. His sister Grace travelled the world as a nurse. Janet, Frances and Mabel went to Canada but were still unmarried in their forties. And Lilian and Margaret married in their mid forties. Edith hasn't as yet been traced. Listed in Wylly pg 24 as being part of the officer corps of the 5th Battalion when the order to mobilise was received on 4th August 1914. Wylly reports there are no war diaries for Feb-April 1918 but the Battalion was on the Somme. In April the Battalion was sent to the base of the 11th Battalion and was involved in training Americans as a Pioneer Battalion. 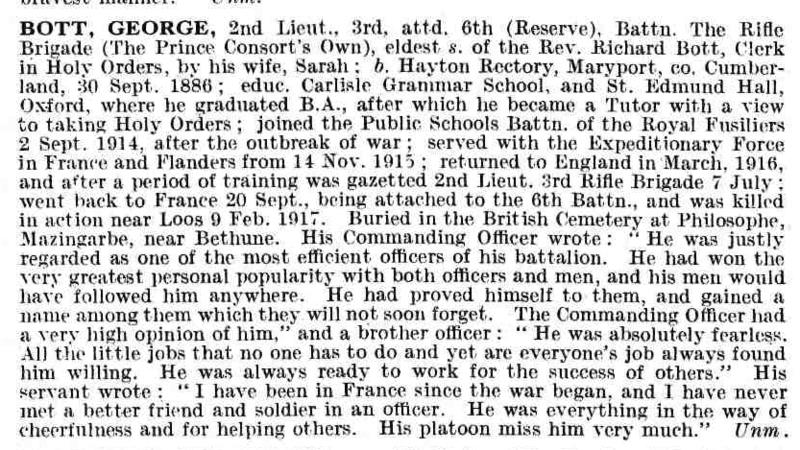 On pg 195, Wylly reports the Battalion was "not actively engaged during the months of May, June and July..." As he died at a Casualty Clearing Station, he could have been injured at an earlier time. Wylly reports "ten days of hard fighting" in March which had resulted in heavy casualties. (pg 175) It is likely that Dodgson was injured at this time. 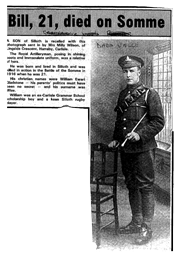 Wylly pg 179 reports that Captain Dove of the 8th Battalion was killed while marching up on 21st March as "huge artillery fire opened�and the German heavy guns bombarded the railheads, supply depots, dumps and camps in rear�"
Robert was born in Burma, son of an Irish father and Burmese mother. He was one of three children born to them, they had married in Burma in 1896. His father was a barrister who became President of the Burmese Legislative Council. Why Robert was sent to Carlisle Grammar School is unknown, he was Church of England which may have ruled out a lot of schools in Ireland. 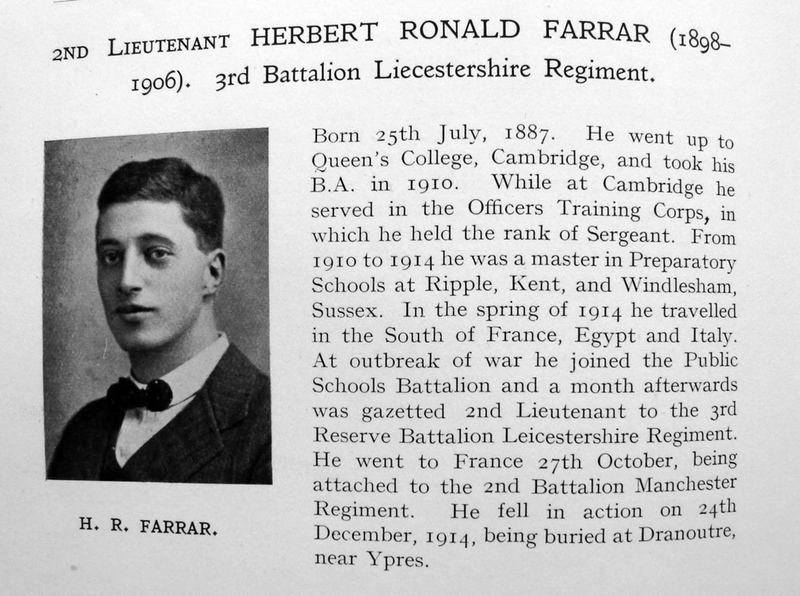 After leaving Carlisle Grammar School Robert went to Glasgow University to study Engineering however he was there for only a short time as he signed up for active service on the 8th Sept 1914. 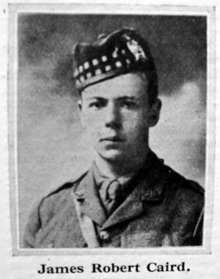 He joined the 6th Battalion Queen's Own Cameron Highlanders, he was 5 feet 6 � inches tall and 133lbs, with a dark complexion, dark hair and brown eyes. 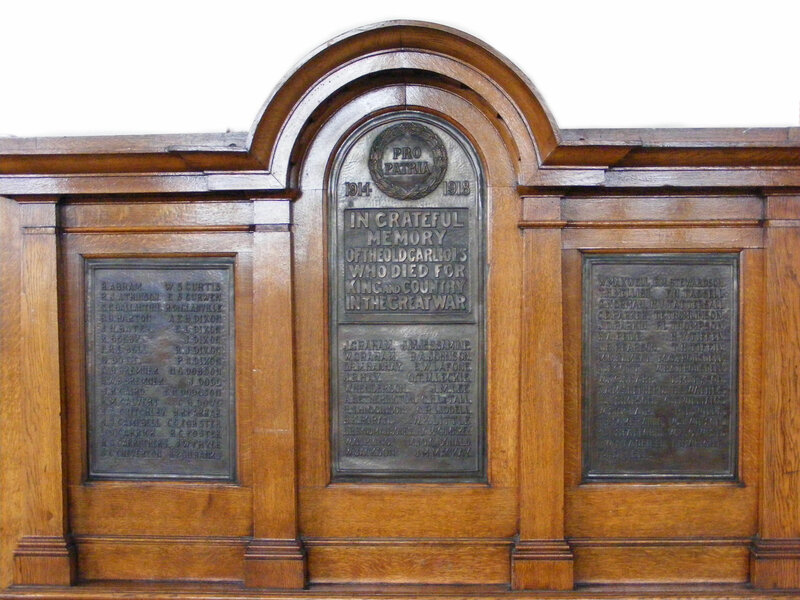 The Grammar School Memorial register reports he was a Sergeant, killed on 1st July 1916 aged 21. 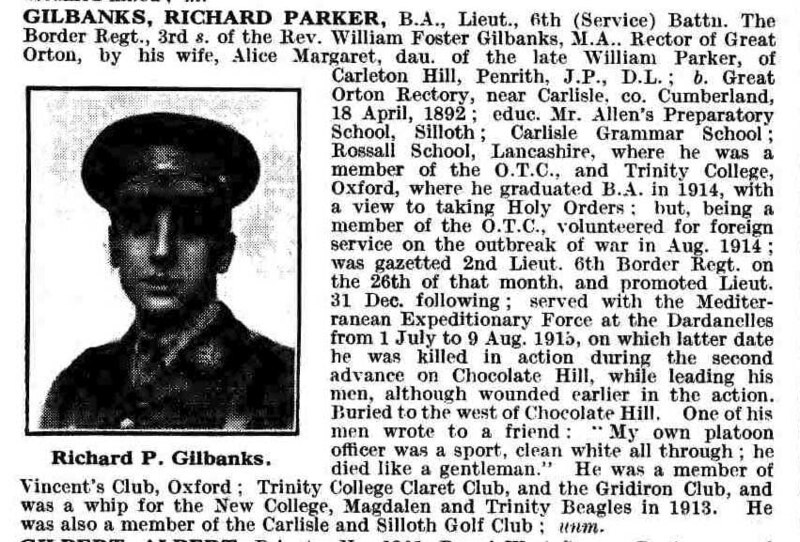 CWGC reports he was a Corporal, aged 33, killed 18th Nov 1916. He is commemorated at Thiepval. There was another W Graham of Carlisle who was killed on 18th Nov (also in the 11th Battalion Border Reg) who is commemorated at Frankfurt Trench British Cemetery, Beaumont-Hamel. Has CWGC confused the two? 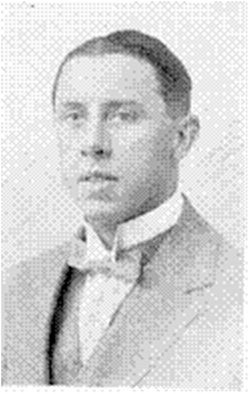 Beresford Karr Horan was the elder son born 14th Jan 1892 to the Rev Charles Trevor Horan and his wife Edith. Both families had an army and church tradition, which included service overseas, indeed the Rev. Charles had been born in India and was Chaplain of All Saint's Cairo when Beresford died. The Horan family also had a tradition of attending Cambridge University. Beresford's family moved around with his father's career. Beresford was born in Cambridge; he had one brother and one sister, and by the age of nine he was already away at boarding school in Norfolk. He attended the Grammar School for just one term before moving on to The Royal Naval College and Marlborough College. However in 1909 aged just seventeen he defied family tradition and emigrated to Canada to farm, he was still in Ontario, Canada in 1911. He enlisted in the United States Marine Corps 14th June 1913, where he served for nearly two years, he was in the band, based mainly in California. 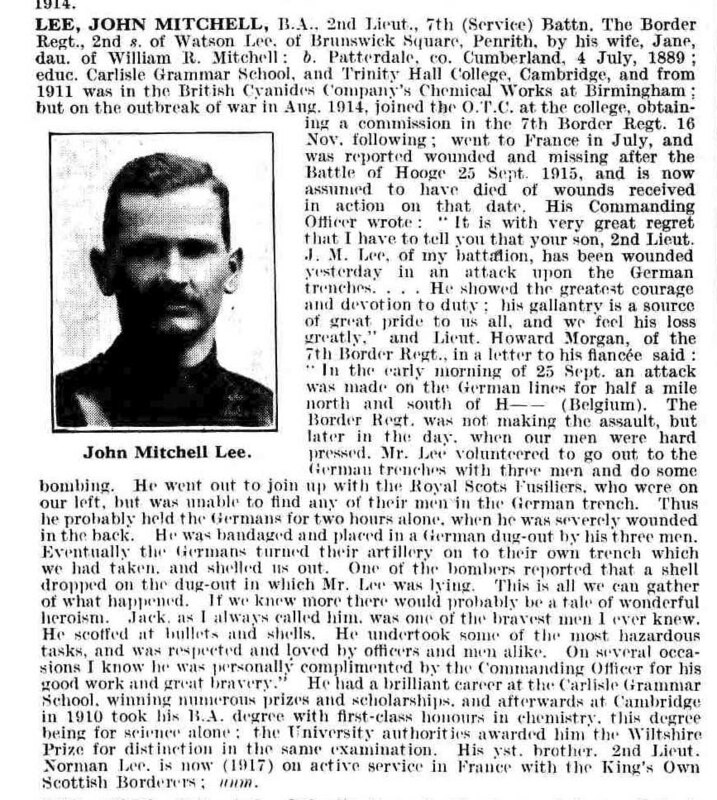 In Feb 1915 he is listed as a deserter from the 4th Regiment the US Marines. We have been unable to find out why he deserted, however we do know that some soldiers deserted the American Army to join up elsewhere as they wished to fight and the USA did not enter WW1 until 1917. 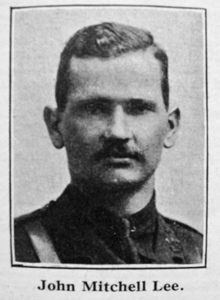 Beresford joined the 30th Wellington Rifles part of the Canadian Expeditionary Force (CEF); however he was listed as a deserter 17th Nov 1915. 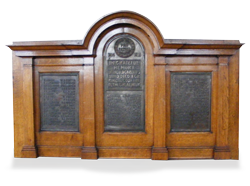 The Carlisle Memorial Register states that he "died from pneumonia following diphtheria contracted while training with the CEF". However he was in disgrace as the Canadian Army refused him a War Grave as he was a deserter. He did have a magnificent gravestone where he was laid to rest in Mount Pleasant Cemetery, London, Ontario, Canada. 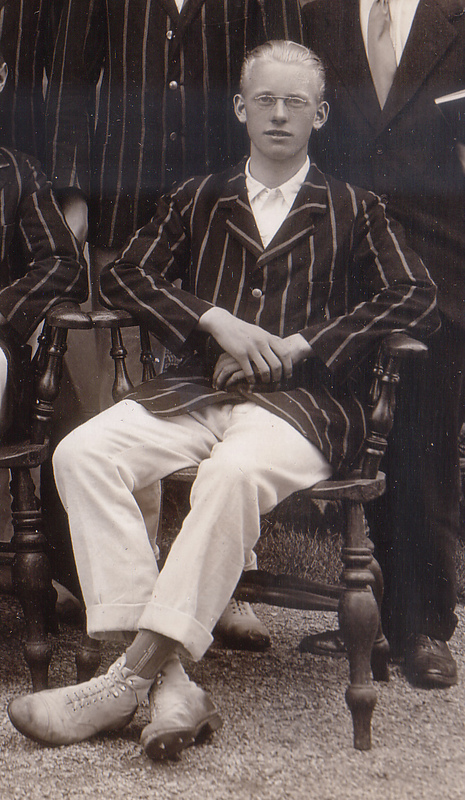 Eric William was the eldest son of Henry Pownall Malins Lafone and Gertrude nee Broadbent. He was born on the 19th April 1896 in Southsea Hampshire. In the 1901 census he was aged 4 years and living in Ambleside. He was educated at Repton and entered Trinity College, Cambridge. When he finished Eric joined the Durham Light Infantry. 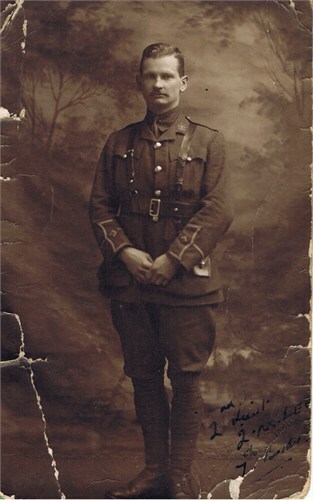 Not long after, his father the Archdeacon Lafone of Barrow-in-Furness received a telegram on the 22nd July 1916 "Regret to inform you that Lt. E.W.Lafone Durham Light Infantry was admitted 14 General Hospital Wimereaux July 19th with gunshot wound and compound fracture of the left arm. 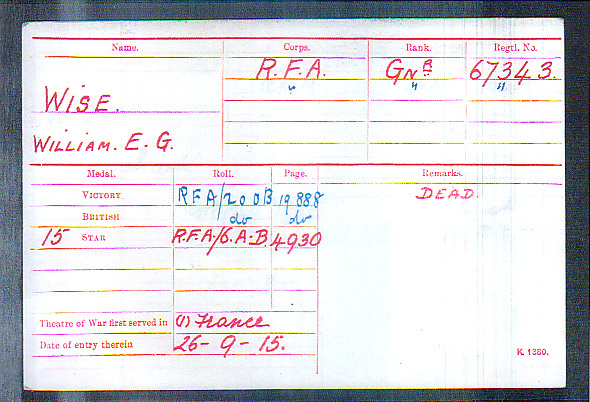 Severe, further reports"
Eric received La Croix De Guerre the French Medal in 1917 for his bravery on the 17th July 1916 at Pozieres France. 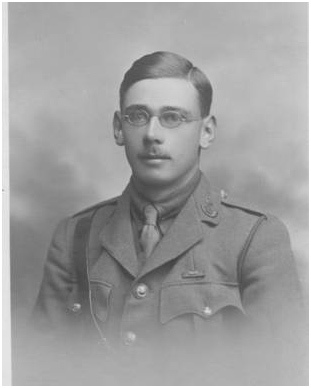 Eric recovered from his injuries and returned to his regiment as Captain, fighting in Asiago Italy. It was here in 1918 that he was killed. Read the reports about his death by clicking the link below. For Further information on Eric Lafone view this word document. 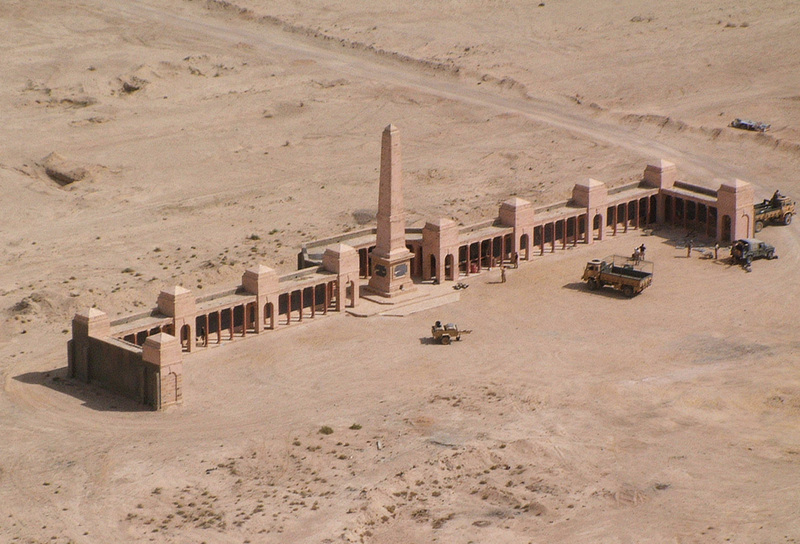 Until 1997 the Basra Memorial was located on the main quay of the naval dockyard at Maqil, on the west bank of the Shatt-al-Arab, about 8 kilometres north of Basra. Because of the sensitivity of the site, the Memorial was moved by presidential decree. The move, carried out by the authorities in Iraq, involved a considerable amount of manpower, transport costs and sheer engineering on their part, and the Memorial has been re-erected in its entirety. The Basra Memorial is now located 32 kilometres along the road to Nasiriyah, in the middle of what was a major battleground during the first Gulf War. The 1st/4th battalion arrived in India in December 1914. 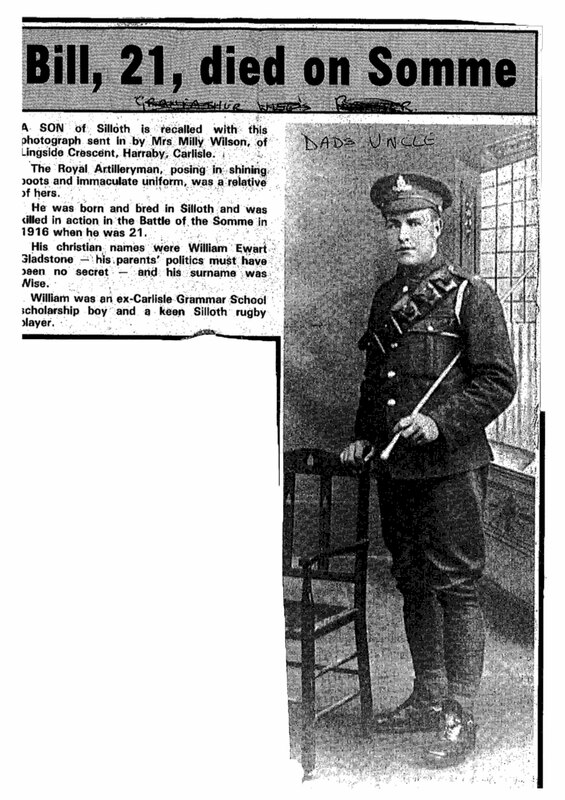 Wylly reports that in August 1915, a detachment under Lt Wilson was sent to Mesopotamia for service. (pg 215) There are no more details. Was McCumiskey part of this detatchment? What was his cause of death? Additional information: Son of Dr. M. and Isabella Ogilvy-Ramsay, of Carlisle. Grave/Memorial Reference: Plot 5. Row C. Grave 4. 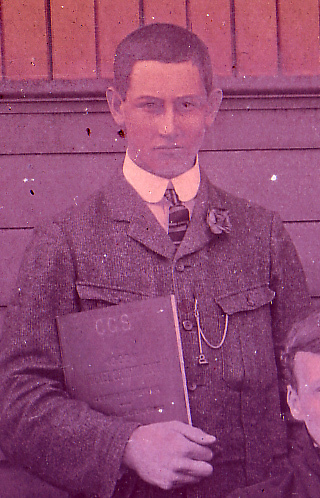 William Trousdell was educated at Carlisle and Queen's College, Oxford, graduating in 1903 after his studies were interrupted by service in the South African War. He was then appointed a clerk in the Colonial Audit Department in 1904. The following year he received an overseas posting and assumed his duties as Assistant Auditor at Calabar, Southern Nigeria, making a journey up the Cross River in November and December. 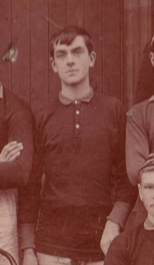 From January to July 1906 he was based at Bonny and returned to England on his first leave abroad immediately after. Trousdell arrived at Bonny for his second tour of duty early January 1907 going on leave again mid-October of the same year. He returned to Lagos as Acting Local Auditor in February 1908, and was transferred to the Treasury as a Financial Assistant in July 1908. Prior to the amalgamation of Northern and Southern Nigeria on January 1 1914, Trousdell was appointed Chief Accountant of the combined Railway Department. While returning from England on leave his ship was torpedoed by a German submarine in St. George's Channel on March 28 1915 and Trousdell perished. 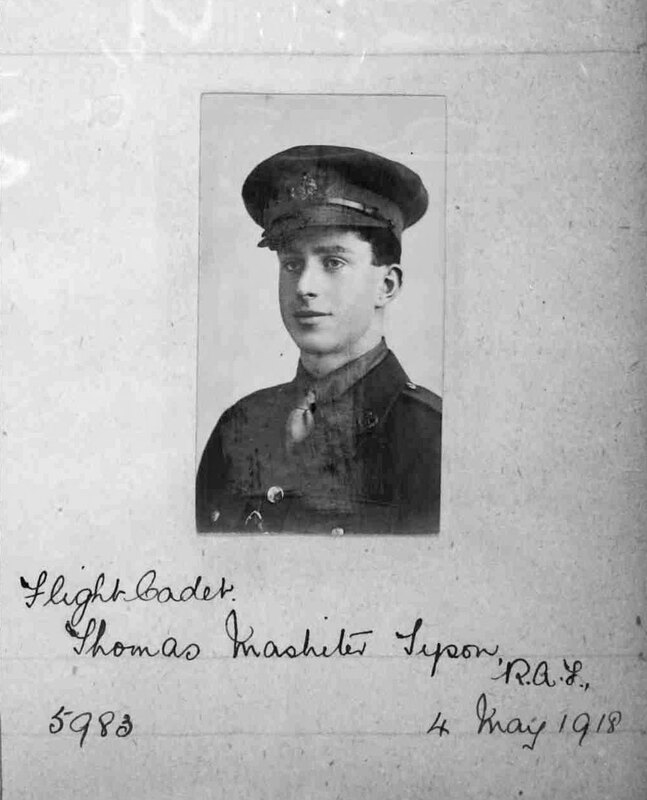 CAPTAIN THOMAS SIDNEY WATHES, Royal Warwickshire Regiment, is reported missing, believed to be killed, and from a letter received from his brother, who is also a captain in the same regiment, it appears that he was shot in the head and killed while leading his men close up to the German trenches. 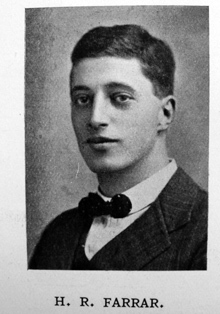 The third son of Mrs. Wathes, of Park Hill, Moseley, Birmingham, he was 28 years of age, and was educated at King Edward's School, Birmingham, Carlisle School, and Wadham College, Oxford. 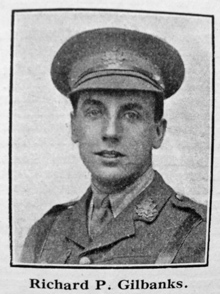 He received his commission as lieutenant in November, 1914, and was subsequently promoted captain. 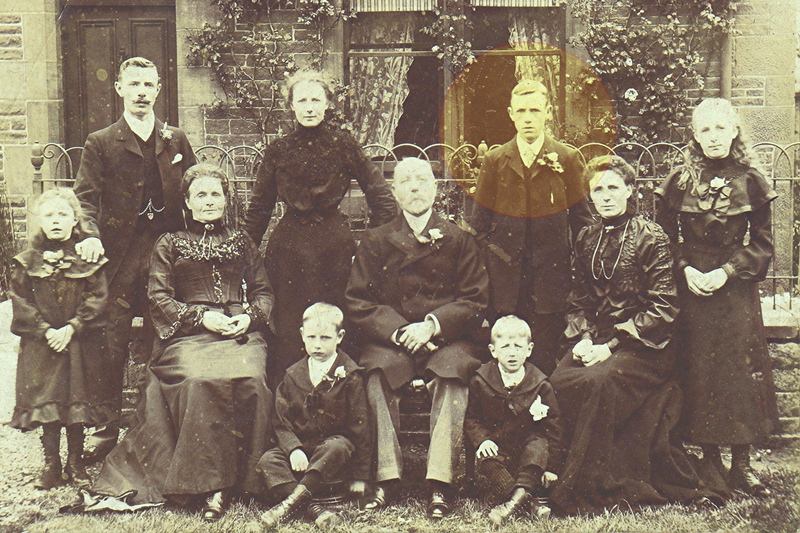 He married in 1913 a daughter of Mr. A. R. Collins, Highfield-road, Moseley, and Newhall-street, Birmingham, and leaves a widow and one child. 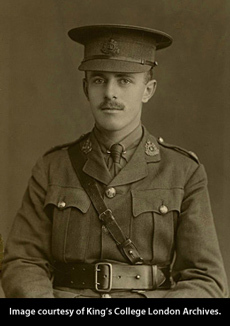 Captain Wathes has two brothers serving in France-Captain C. H. Wathes, of the Royal Warwickshire Regiment, and Private Watson Wathes, of the R.A.M.C.